It's hard to believe that this is my fifth year of putting together a North Pole Breakfast for our girls. 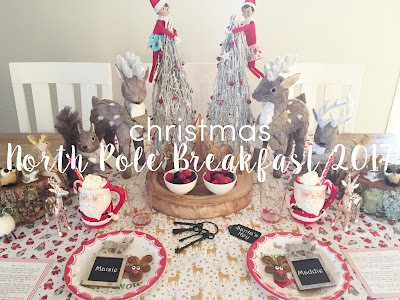 If you're new to my blog just search North Pole Breakfast in the search bar to check out the previous years. I try for a different look and theme each year. This year I ran with a woodland theme after seeing the adorable range of woodland creatures in the Ezibuy Christmas catalogue. I mean, how cute are these little guys! I raided a friends woodshed for some mossy logs for them to sit on. (Psst... keep reading on for an exclusive reader Ezibuy discount promo code at the end!). And the theme just grew from there. Luckily for me there's a lot of great woodland themed things around at the moment and I was able to easily grab some things that all fitted together really well. I got the white twig Christmas trees and large reindeer and squirrel from Bed, Bath and Beyond. I was back in their store over the weekend and I see their Christmas range is 60% off at the moment! The little woodland setting around the berry bowls is from Kmart. The sliced wood server is from Linens & More. I set each of the girls place settings with a mix of old and new. I bought the plates and tumblers from Pottery Barn Kids a few years ago. The Santa mugs were on sale from Stevens. I made the girls peppermint hot chocolate using Kokako Drinking Chocolate and Tatua Whipped Cream and popping a candy cane in the side. It was SO delicious! The tablecloth was two different fabrics from Spotlight. I couldn't decide between the two so ended up buying and using both. The rose gold reindeer are from Spotlight. Red and gold paper straws from Pop Roc Parties. The little deer name tags were Christmas tree decorations from The Warehouse. I just cut the ribbon off and cut out a little vinyl name label. The super sweet reindeer gingerbread iced cookies are by the very talented Walter and Rose Artisan Bakery. I just love their beautiful themed cookies available from Farro. And this year they also bought a set of magical Santa keys! This caused a couple of issues. Firstly, I made the "Santa's Key" tags before I got the keys out to look at them. I assumed I would be able to take the keys off the key ring so the girls could have one each. I wanted them to have one each so one day when they have their own children they can carry on the tradition. But the key ring was solid metal, Jamie was already asleep by this point and I had no way of breaking it open by myself. And I'd already packed up my vinyl cutting machine so I couldn't make a new sign that said "Keys" instead of "Key". Not exactly what I wanted to happen but the girls still love them. I'll have to sort it out for next year! But secondly, Maisie came in bawling her eyes out at 5.50am because she thought Santa had left his keys behind and how was he going to deliver everyone's presents without them. Very sweet! But it took a while to convince her that this is our special set for our very own front door. Phew! Crisis averted! I got the keys by the way earlier in the year from the Howick Historical Village gift shop of all places. The elves also bought a few little Christmas treats with them to kick off the festive season. I know a lot of people like to do Christmas Eve boxes but we do it at the beginning of December so they can enjoy them all month long. The cute woodland fabric gift bags are from Kikki-K. The girls received new Christmas pajamas, Christmas books and activity book, a little Christmas LEGO set and a Christmas Pez. The girls loved the woodland North Pole Breakfast and completely adore all the woodland creatures. I think that's about all the details of this years North Pole Breakfast but let me know if you have any questions at all. There's just one more exciting thing! The lovely people at Ezibuy have given us a special discount code just for my readers. Simply visit Ezibuy, load your shopping cart with lots of lovely goodies and enter HOUSEWIFE at the checkout to receive 20% off all home and giftware*. How awesome is that! The little woodland creatures I used are still available and there is still plenty of time to place your order. Thank you so much Ezibuy! Code valid until 19 December. T&c's below. - 20% off offer valid until midnight 19 December 2017 or while stocks last. - The offer applies to the current price of Home & Gift in our online promotion sections only. - The promotion code HOUSEWIFE must be used at the time of purchase to activate the offer. - All sizes and colours may not be available. - Offer valid online only, excludes orders placed via fax, call centre, email, mail order or instore. - Offer excludes Next, gift cards, top-ups, personalised gifts and extra costs associated with delivery of gift cards, personalised gifts, large/oversized delivery items and international orders. - Offer cannot be used in conjunction with any other offer or promotion, nor backorders. - Our standard returns policy applies.